After a year off spent stockpiling new acquisitions and such, Stu of Winstonsdad's Blog and I have decided to host another edition of Spanish Language Literature Month in July 2014 under the catchy yet no nonsense moniker of Spanish Lit Month 2014. Hope that you'll decide to join us. For those new to the event, the basic idea is that those participating will read one or more works originally published in Spanish and contribute a review or reviews of what you've read so that other event participants can visit your site and leave comments, mash notes, etc. Naturally, you may read the work(s) in Spanish or in translation depending on your language skills and interests. Stu and I will do at least one monthly link round-up to facilitate discussions, but there will prob. be more frequent ones than that if the turnout is anywhere near as numerous and enthusiastic as it was in 2012. Want to participate in the event but not sure what to read for it? Check out Spanish critic Ignacio Echevarría's list of his idea of the essential books in Spanish-language literature since the 1950s here. Or check out Semana.com's list of the 100 best Spanish-language novels of the last 25 years here. Way too recent recommendations for someone of your snooty archival bent? "Good literature needs to breathe a little after it's decanted" and all that? Then how about 100+ More Reading Recommendations for Spanish Lit Month 2012, which provides three top U.S. universities' reading lists for the canonical works dating back to the medieval era in Spain and the colonial era in Latin America? For those wanting a simpler choice, you can also choose one or both of our group read selections set to be discussed during the last week in July: Gabriel García Márquez's 1996 News of a Kidnapping [original title: Noticia de un secuestro] (Stu's pick)* or Guillermo Cabrera Infante's 1967 Tres tristes tigres [translated title: Three Trapped Tigers] (my pick). 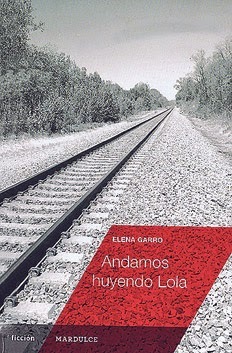 ** For my part, I'm also considering Mexican Elena Garro's 1980 Andamos huyendo Lola, whose "novel" in the form of 11 linked tales about two characters on the run is said to bear some similarities to Roberto Bolaño's Los detectives salvajes [The Savage Detectives], and--well, let's keep the other choices secret for now, eh? You'll find out or not find out soon enough anyway. *Stu plans a Gabriel García Márquez theme week for the last week in July as part of a tribute to the late Colombian Nobel winner. Details forthcoming. **I'm happy to note that the Guillermo Cabrera Infante novel is being read in conjunction with Richard of Shea's Zibaldone, who is hosting a Javier Marías-inspired Kingdom of Redonda Readalong this year. I'll try to read Pardo Bazán's The House of Ulloa. I mean, who knows what life will bring. But that's my plan. The Redonda readalong is a primo idea. Tom, interesting choice! I know next to nothing about the writer other than her name, but looking up The House of Ulloa online, I see that it does sound like your kind of thing. One of your kinds of things anyway! P.S. Agree with you on the Redonda Readalong (almost wish I had thunk it up). Richard, I had such a blast the last time around that I can't imagine not joining in this time. Heck, maybe by July I can finally get around to posting on some of the Spanish language literature I've read already this year. Scott, glad to hear you still have such fond memories of Spanish Lit Month 2012. As always, I look forward to seeing what you'll choose to write about for the event be it new or back catalogue material in terms of the posts. I hope to add another short story translation or two this year if I can find the time. I really need to read more Spanish literature. I will try to join you. I look forward to also reading everyone's posts. Brian, you're very welcome--and glad to hear you'll try and join us this year! There was quite a range of material reviewed last time, so I'm really looking forward to reading everybody else's posts as well. Cheers! I promise not to, Bellezza--and mil gracias for joining us! Excited to have you join us, Amanda! Looking forward to seeing what you settle on reading, too. Cheers! wouldn't want to miss this. the previous edition was dope. "Word," ha ha, thanks. Seriously, Rise, it wouldn't feel like a Spanish Lit Month without you! Sure, I'll join it, it's just one measly book. What's that? Miguel, that's exactly the sort of "macho" approach that people ought to pattern themselves after for these sign-ups. ¡Bien hecho! If it's not too late, I'll try to read "Tormento" by Benito Pérez Galdós (rather confusingly translated as "Inferno" before the end of May. Himadri, that's wonderful--glad to have you join in on the fun! Also, you're in luck: you have until the end of July to read that Galdós and not just May. Cheers! Excellent! I'll definitely have read that by the end of July. I'm notoriously bad with events this year but I still hope to join you. At least for the Marquez week or anything else. I'm with you on the events struggles this year, Caroline--even with my own! However, I'm delighted you'll try and join us again. Maybe time for another Maqroll novella? Cheers! Bookertalk, thanks for the visit--hope you enjoy your reading! Hi Richard, I'm planning to join your Spanish Lit Month. I'll be reading 'Severina' by Rodrigo Rey Rosa and Nada by Carmen Laforet - these two are definites. I've also got a few others sitting on my bookshelves so I might squeeze another into July. Looking forward to it! JacquiWine, hello and welcome to the blog! I loved Nada and have greatly enjoyed the two Rey Rosa novelas I've read to date, so I look forward to comparing our reactions to these two authors (Severina is a title I don't know anything about, though). Probably about half my authors will be coming from Argentina and Uruguay, so I look forward to the diversity you and the other readers will be bringing to the event. Cheers! Maybe this is a dorky question. What about novels translated from the Catalan? I wanted to focus on literature from Spain. I guess that's OK too, right? Caroline, great question! Since Franco banned Catalan during his dictatorship, I think it's only right that we make an exception for it during Spanish Lit Month to make up for that cultural and linguistic slight. In other words, read away to your heart's content in Catalan & Visca Catalunya! I looked at The Best European Fiction anthologies for 2012 and 2013, there are five stories by Spanish writers. I will hopefully at least read and post on them for the event. Mel, great--nice to have you join us for the event! I hope to get to a # of short stories, too. Cheers! Bookertalk, thanks--will be by to check out your post. However, you still have a whole month to read something else if you like! Oh really? I suppose I should have paid more attention! Will hVe to go rooting around those bookshelves again. Tony, belated thanks for those links! Mel, thanks for all the links--will add the new one(s) to the next weekly round-up. Cheers!